Best Chinese Knives: Ganzo Firebird F753M1 G753M1 - Best Ganzo EDC Knife yet? Ganzo Firebird F753M1 G753M1 - Best Ganzo EDC Knife yet? This knife has finally reached me (was sent by GearBest through Azerbaijan as part of their new shipping method). - Knife have arrived in a standard Firebird box with a microfiber branded pouch. No issues out of the box - centering, lockup, action all close to perfect (definite improvement over other Ganzo Firebird models I had). - Quality out of the box - I was really impressed with this, especially since I had to work on the other ones I had (including the F7533) lube it and tweak the action for them to work right. With this one it feels different, which is great, cause disassembling an Axis Lock knife isn't the most pleasant experience. It is also pretty impressive, since they didn't really changed anything in the basic construction (still 2 washers - 1 nylon and 1 bronze), so either I got a great piece or Ganzo have improved their tolerances and quality levels. - The action and the Axis Lock - One thing that certainly feels different from the other, larger models is the lesser tension of the omega springs in the lock and the blade tang geometry, which improve the action and the overall experience from this knife and make it feel almost as a genuine Axis lock from Benchmade. - Other honorable mentions - open-back construction on standoffs and smaller, more comfortable thumb studs. - The fact, that in opposite from some of the major knife brands Ganzo Firebird listen to their customer's requests and finally made a smaller and lighter 3'' version of their larger model, and that is a beautiful thing IMO. - One thing I could mention is the satin finished pocket clip. If this one had a black one, or even better a deep carry one, I would love this blade even more. - Not going to make stuff up - nothing ugly at all about this blade. 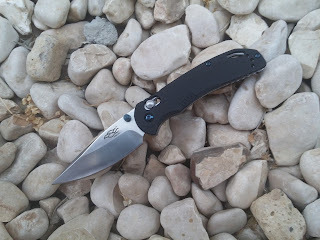 - This is hands down the best quality Ganzo knife I ever handled and definitely my most liked one. It feels different (in a better way) than the larger version that I had (the F7533) and the closest to a genuine Benchmade knife. The fact that it is significantly smaller and lighter will make it a great option for a budget EDC knife that you will not be afraid to use (because of the low price). I am excited to see Ganzo improve and will definitely expect more smaller knives in the M series and maybe even some original designs from these guys. Another great review, my friend. I have the G7531 CF and it came with no major issues including a soft axis lock and perfectly centered blade. There's no way I would bust out that blade in front of people just to open a box, however. Lately I've been realizing I need some more EDC-able knives and this review has finally sold me on the G753M1. I too hope for more M sized knives...flippers with bearings would be great! Thank you for the review...I am learning about these knives and was hoping you could explain difference between the f and the g? And what does the cf mean? And dies m usually signify smaller size? Thanks!